Named after the Latin for ‘reverse’ and housed in exquisite, award-winning packaging, Verso have made defying signs of ageing easy. Enhanced with both alpha and poly hydroxy acids, this gentle exfoliating gel brightens and rejuvenates by removing dead skin cells, unblocking pores and accelerating cell renewal, leaving skin smooth and radiant. The naturally occurring, organic acids also boost collagen production to minimise the appearance of fine lines and wrinkles, while pomegranate enzymes provide antioxidant protection. 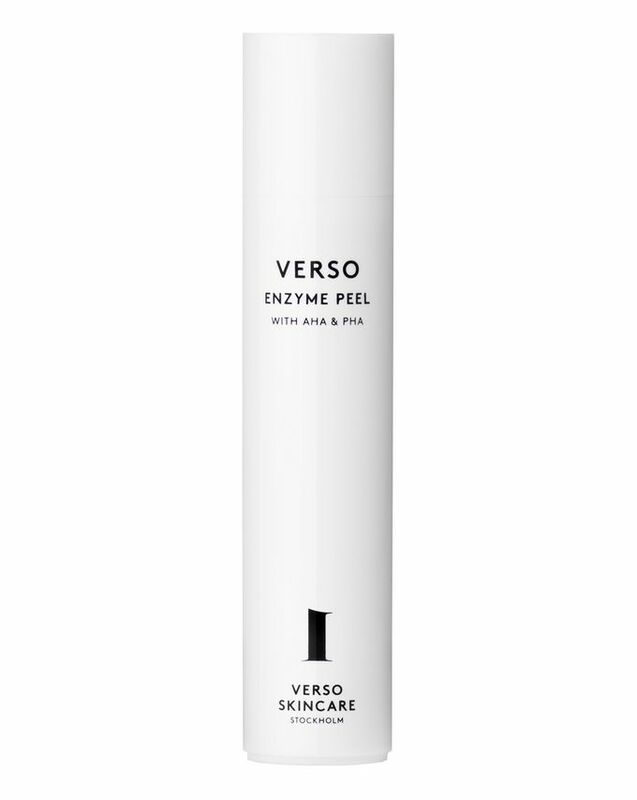 Brighten and rejuvenate your complexion with Verso’s Enzyme Peel, a gently exfoliating gel that’s enhanced with both alpha and poly hydroxy acids. Naturally occurring, these organic acids contribute to accelerating the cell cycle and increasing the production of collagen, which minimises the appearance of fine lines and wrinkles. Formulated with a proprietary combination of high-quality AHAs and PHAs, this peel is able to gently exfoliate the outer layer of skin, removing dead skin cells, unblocking pores and accelerating cell renewal to leave skin super-smooth and radiant. AHAs increase skin’s thickness and bolster collagen density, while PHAs moisturise, purify and deliver free radiance protection. Enhancing this, the formula is also enriched with niacinamide, turmeric and pomegranate enzymes, the formula also offers antioxidant, skin-renewing, antimicrobial and anti-inflammatory properties to help defend skin and minimise signs of ageing. Apply the peel on cleansed skin. Gently spread over your face and wash it off without rubbing after 1-3 minutes. Verso Enzyme Peel can be used 1-3 times per week. Avoid eye contact. If redness or irritation develops, discontinue use. In case of sun exposure, use sun protection.